Happy Monday, everyone! I trust you all had a fantastic 4th of July holiday weekend. I know I did. Ate way too much food, saw some family that I haven't seen in a long time and just enjoyed being with my own family as we enjoyed some fireworks and down time. Anyway, I am back this week with some new reviews and giveaways, along with some cool freebies for you all! 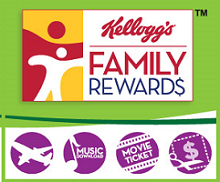 Here are two new Kelloggs Family Rewards Codes for you...I just used them myself so I know they are good but the expiration is unknown so please use them ASAP. Here they are...enjoy! Thank you. I was able to use these codes. I have redeemed some points for coupons too.